Scott Affeldt, assistant fire management officer from Aransas National Wildlife Refuge, left, listens to Robert Jess of Santa Ana NWR as a wildfire burns south of them at Santa Ana NWR Thursday, March 8, 2018, in Alamo. Affeldt is one of several firefighters assisting with a fire that started around 3 p.m. Wednesday. 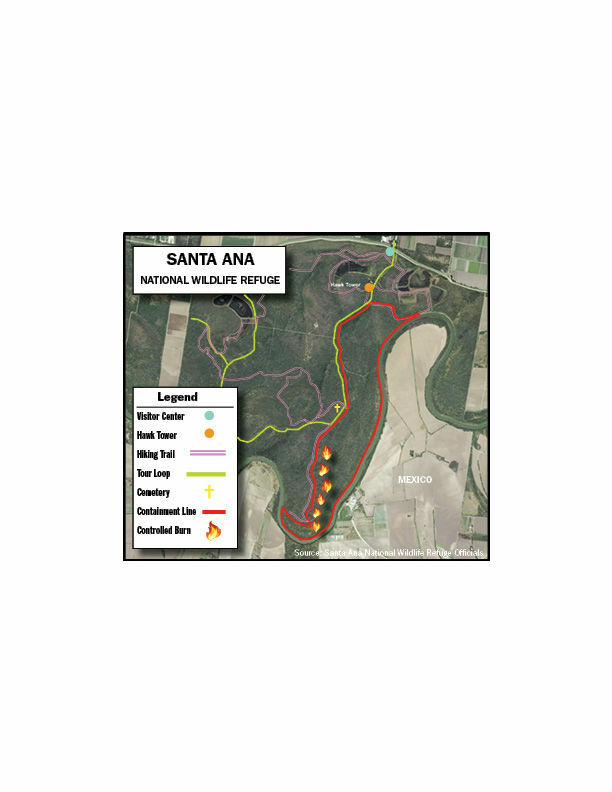 ALAMO — Burning embers that “jumped” the river may have caused a fire that has grown to affect nearly 300 acres at the Santa Ana National Wildlife Refuge, an official with the park said Thursday. At about 3 p.m. Wednesday, wildlife fire crews were called to the refuge — a more than 2,000-acre wildlife tract in Alamo — after officials reported a fire that began along the river bank, Robert Jess said. Jess, Lower Rio Grande Valley National Refuge complex project leader, cited preliminary information suggesting the likelihood that a controlled river cane burn on the Mexican side spread north as a result of high winds, leading to the refuge’s closure. Further exacerbating the fire are the dry remnants of a nearly 10-year-old flood that covers the grounds at Santa Ana, called the duff, or the dried remains of dead trees and other vegetation, further fueling the fire to burn overnight, according to Jess. Rey Navarro, assistant fire management officer at Santa Ana National Wildlife Refuge, talks about a wildfire burning on the refuge Thursday, March 8, 2018, in Alamo. Officials say the fire is now contained. Because of this, Jess said crews were pulled back and a new plan was implemented. Crews changed course and utilized the existing trails and roadways to create the containment line ceding hundreds of acres of thick vegetation. He said fire crews, comprised of 15 to 20 firefighters from Alamo, Donna, San Juan, Pharr, and U.S. Fish and Wildlife, are being cautious in their approach to the fire — citing heavy brush as a factor in their limited access to fight the fire directly. 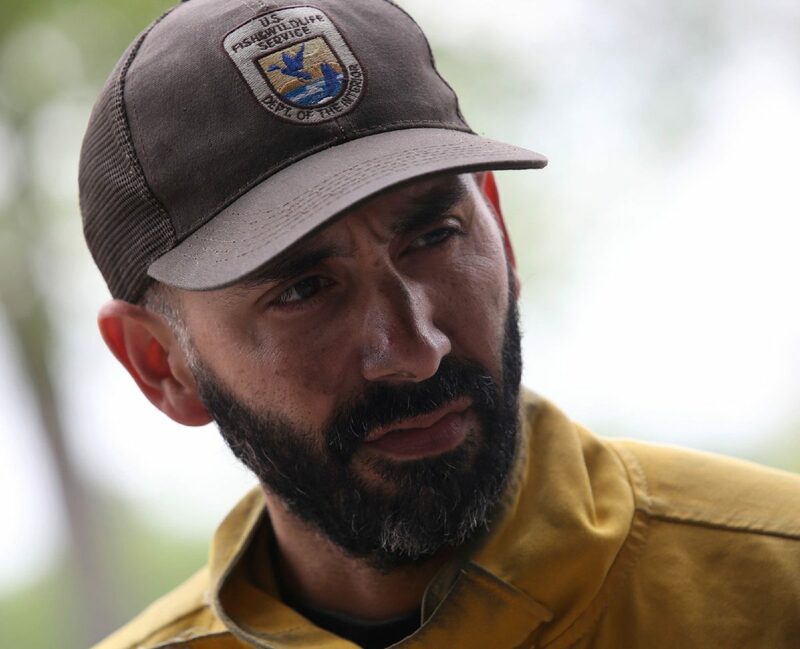 Rey Navarro, assistant fire management officer with U.S. Fish and Wildlife, said they expected crews to have much of the fire contained by Thursday afternoon. Navarro said the crews are utilizing a technique called “back burns,” or controlled fires that are designed to burn in the opposite direction of the wind and the fast burning fire — this in an attempt to slow it down and rehabilitate the soil burned by the fire. This technique is also used to ensure the safety of the wildfire crewmembers, Navarro said. Jason Straub, a meteorologist with the National Weather Service, said over the next couple of days wind will be a factor, but assisting will be added moisture to the area. “Humidity values are going to increase through the next couple of days — that should help conditions from getting too dry (and) should help abate some of the fire potential in the area,” Straub said. Winds in excess of 15 to 20 miles per hour are expected Friday with lighter wind conditions for Saturday, Straub said. Despite the continued burn, there has yet to be any reported damage to any infrastructure in and around the refuge — including trails, roads, buildings, facilities and private property, and no nearby homes have been affected, Jess said. 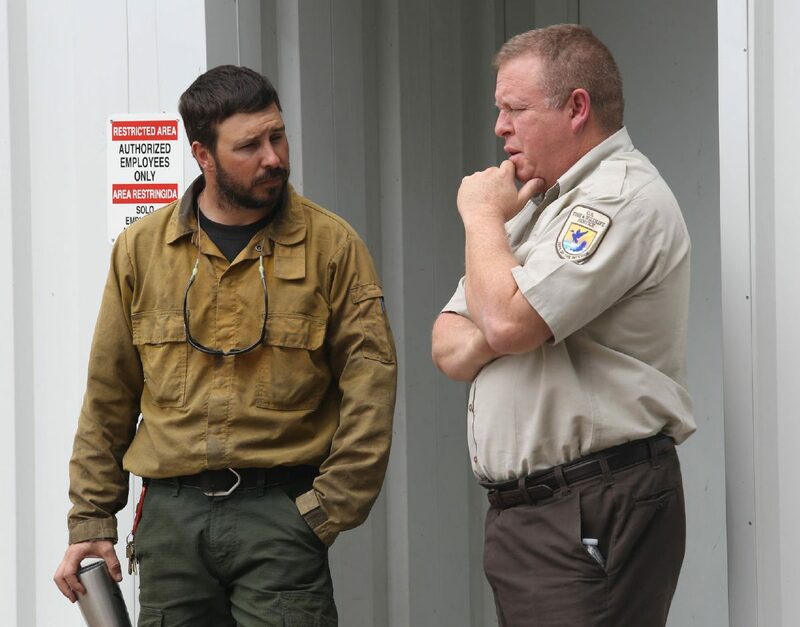 Jess, who acknowledged the public’s desire to visit the refuge during pleasant weather months like March, said he expects crews to work the fire for at least a few more days before determining when it would be safe to open the refuge to the public. There will be a cleanup effort after the fire is extinguished; specifically, refuge employees will be tasked with the “mop up” of the refuge. This will include, but is not limited to clearing out dead timber and knocking down any standing trees that are still burning. As of 6:30 p.m. Thursday, the fire was 70 percent contained, according to Jess. The refuge may open Friday; however, Jess said that decision would not be made until after midday.